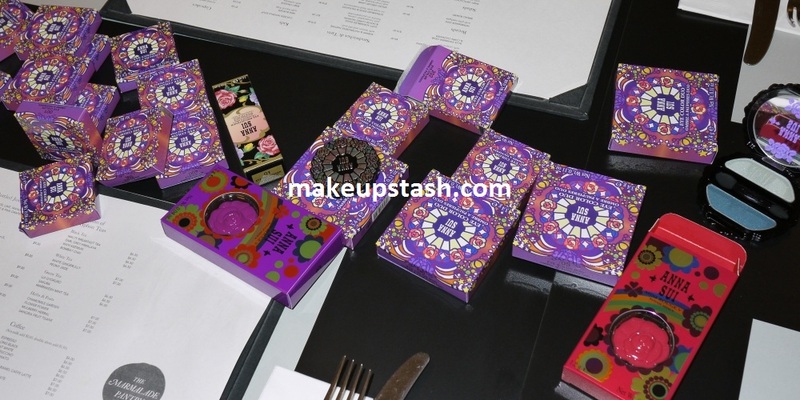 Anna Sui Autumn 2010 Makeup Party | Makeup Stash! 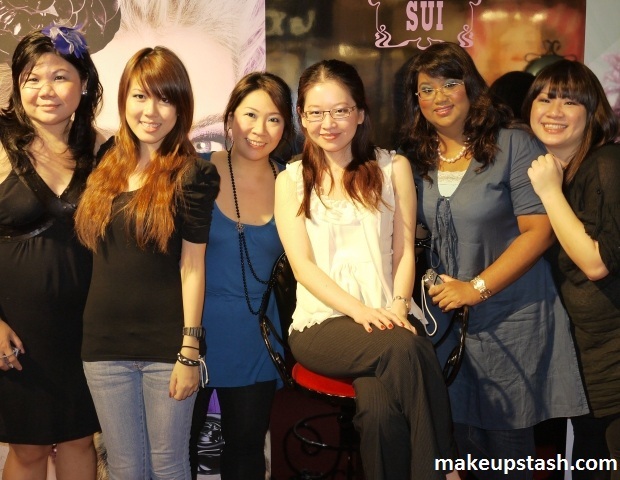 I had an enjoyable tête-à-tête with the lovely Anna Sui people last week. 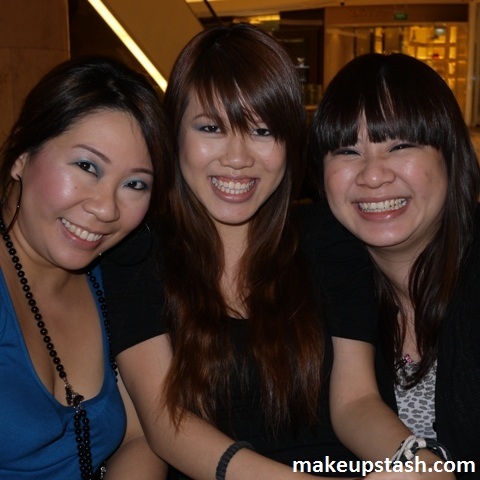 We met at The Marmalade Pantry, where they treated my beauty blogger friends and me to gastronomic and beauty delights. 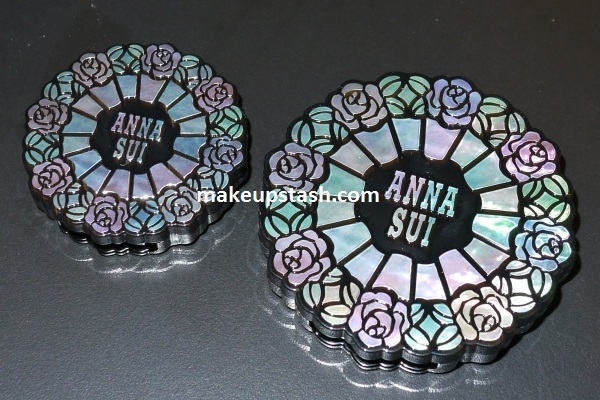 Inspired by Anna Sui’s new interior design for her home, the exquisite packaging of the latest eyeshadows continues the brand’s floral motif but have upped the beauty ante with its multi-dimensional iridescence: the cases reflect a host of pleasing hues in its sheen; the interplay of the blue, purple, green and pink is a joy to behold! 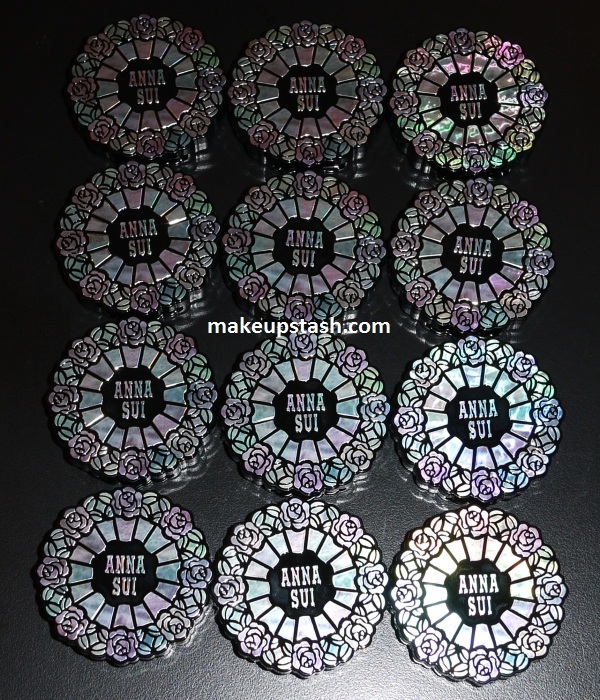 The new eyeshadow singles, Eye Color N, come in different finishes and are now part of the permanent collection – they replace the previous range in the black rose casing. 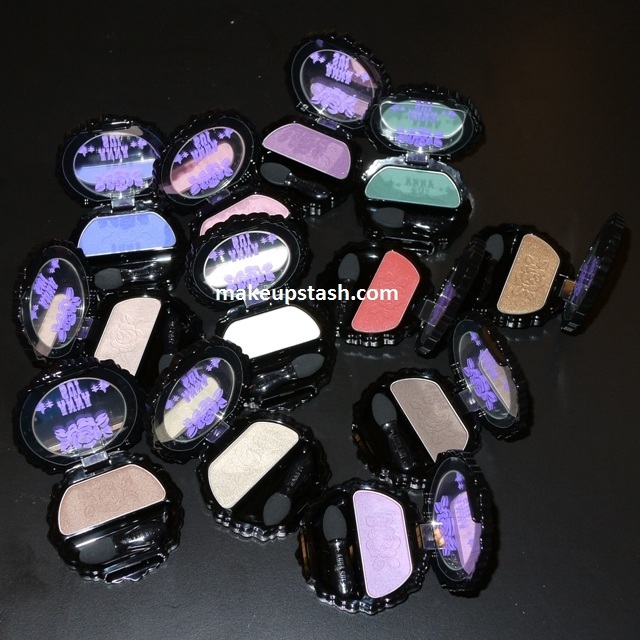 The Eye Color Duos, on the other hand, are limited edition. 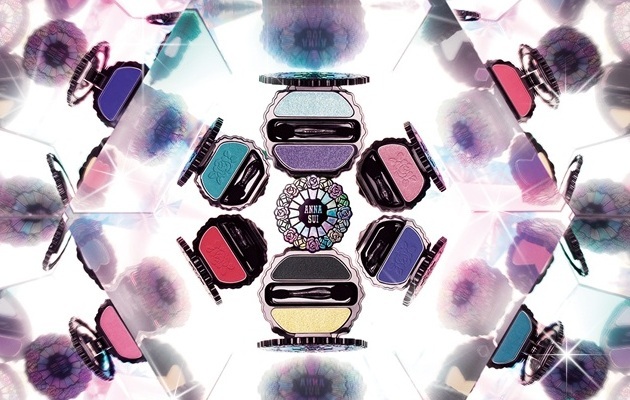 Entirely made in Japan, they are a veritable kaleidoscopic feast for the eyes. …that I couldn’t stop snapping photos of it! 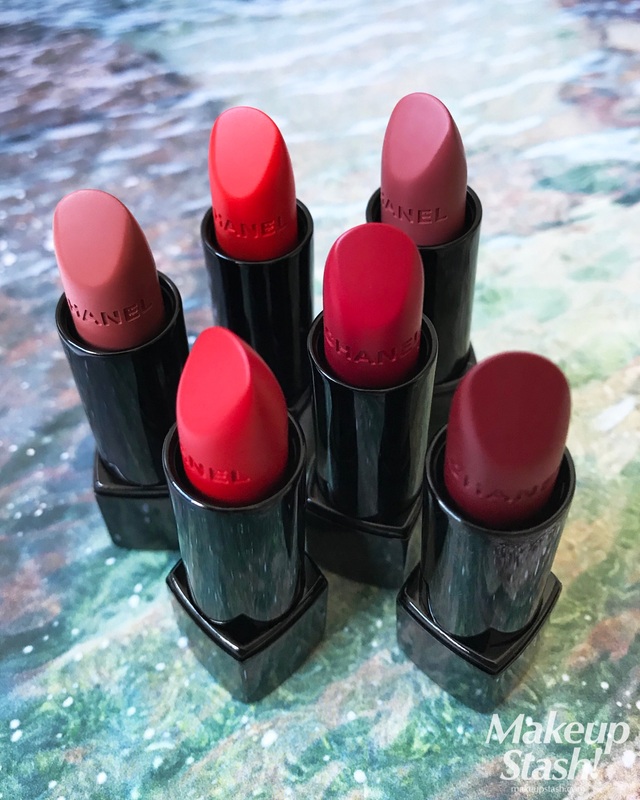 Here are the limited edition Mini Rouge V lipglosses. 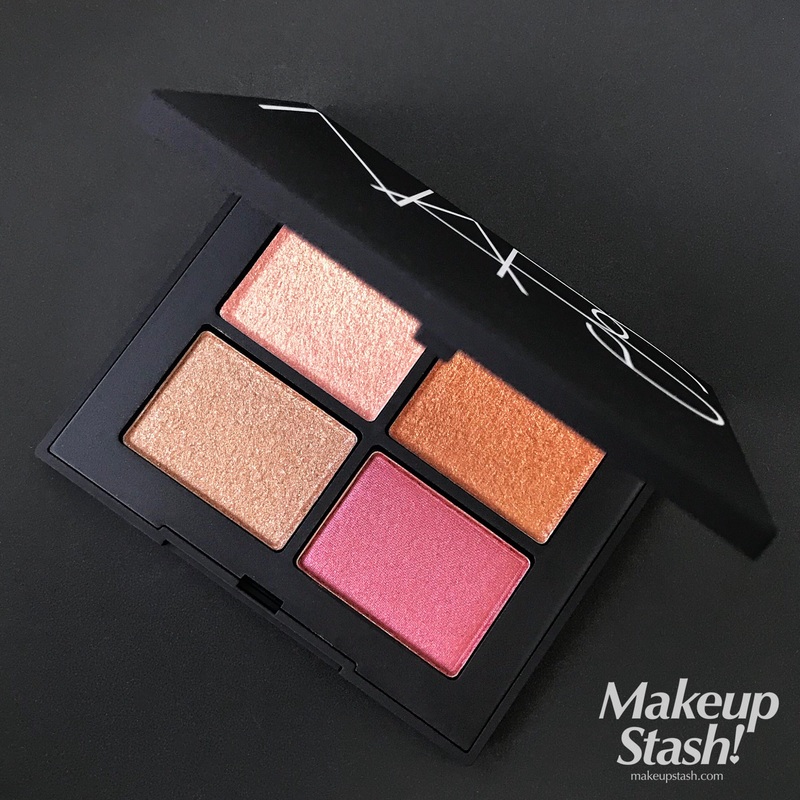 This time round, the cute factor of these little glosses encased in small rose compacts is enhanced by the retro design and bright colours on the boxes. 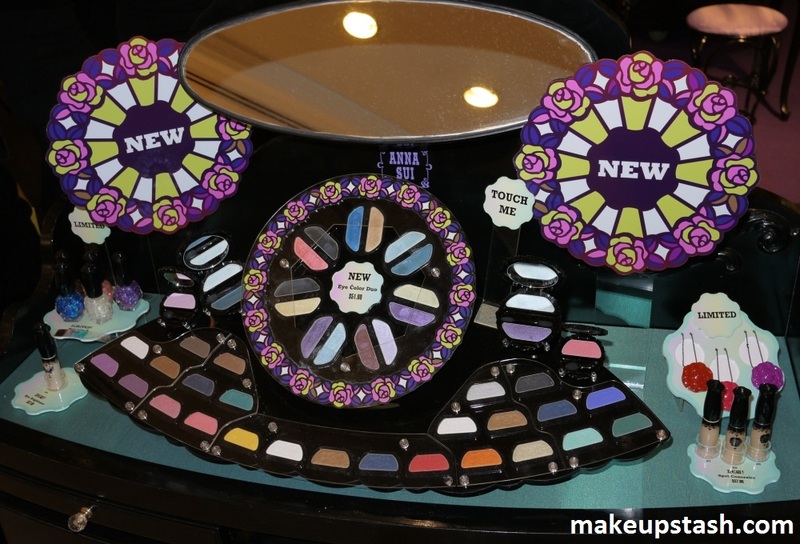 The cheery colours and flowers remind me of Mary Quant makeup. 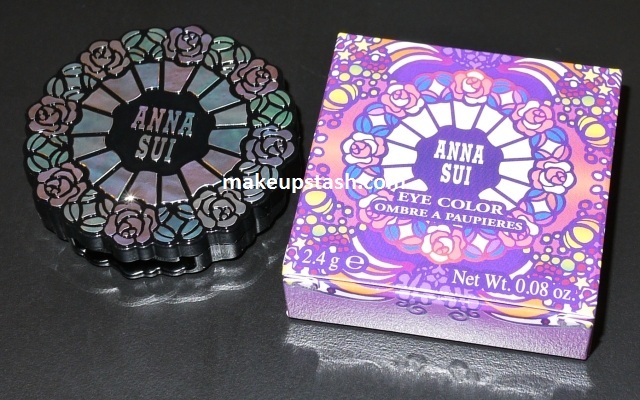 The duos were quite a surprise; I believe Anna Sui rarely makes duos, so it was great to see these bigger palettes. 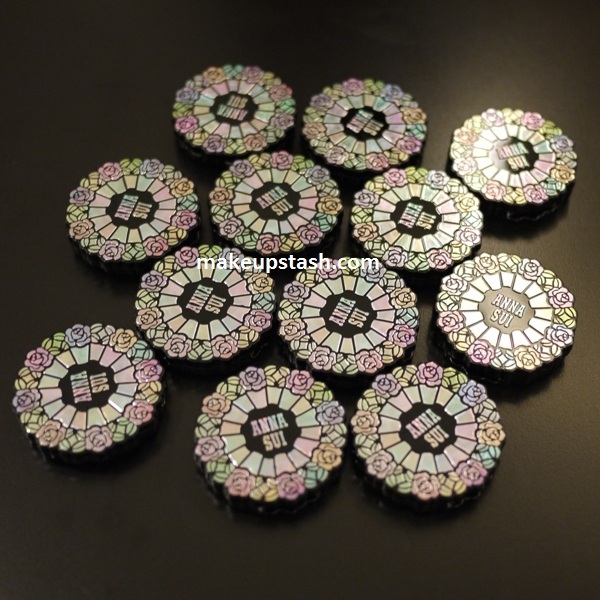 According to the brand, the darker shade of each pair contains silicone to allow the brighter/pearlier shade to adhere better, as well as create a different hue. The smoothness of the deeper shade below the latter makes for easy gradation; blending is effortless with these duos. I like that the darker colours can be used below the lighter shades without caking, despite their almost creamy quality. 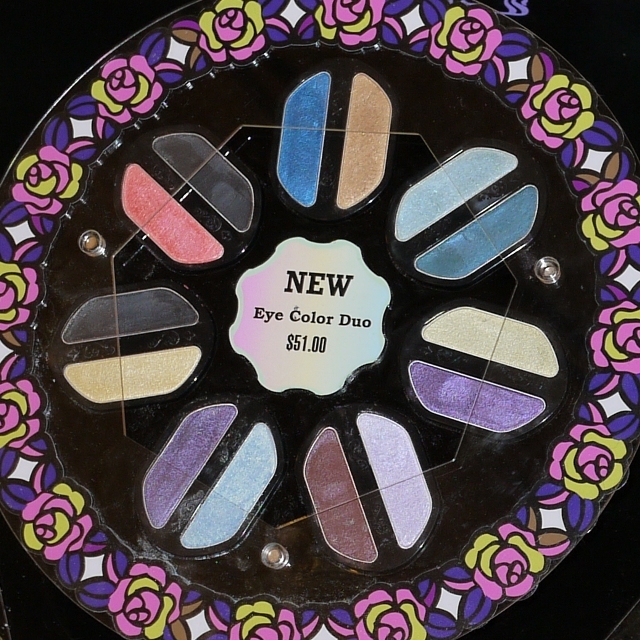 Some of these duos are more pigmented than the rest but they basically wear well and twinkle very prettily…thanks to the makeup ingenuity of the Japanese. More proof of Anna Sui’s unerring beauty sensibilities: Nail Color N, a limited edition nail lacquer range for the fall collection. 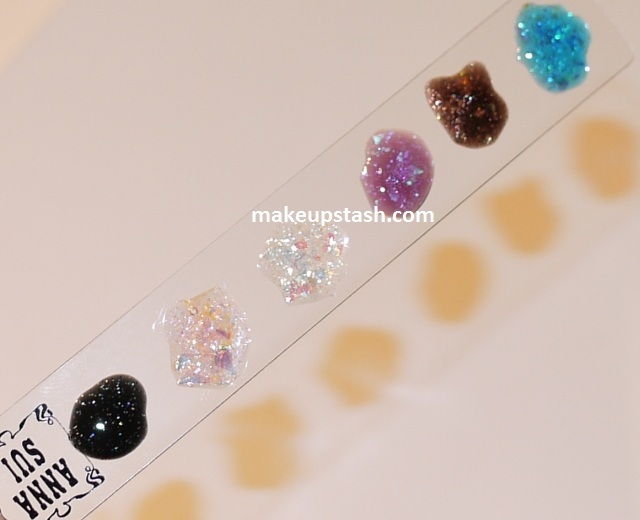 Sparkle and shine, shine and sparkle…these stunning polishes with jelly bases and holographic glitter flakes remind me of the Nfu.Oh polishes in the same finish. They would be a great alternative to the latter and cheaper too. 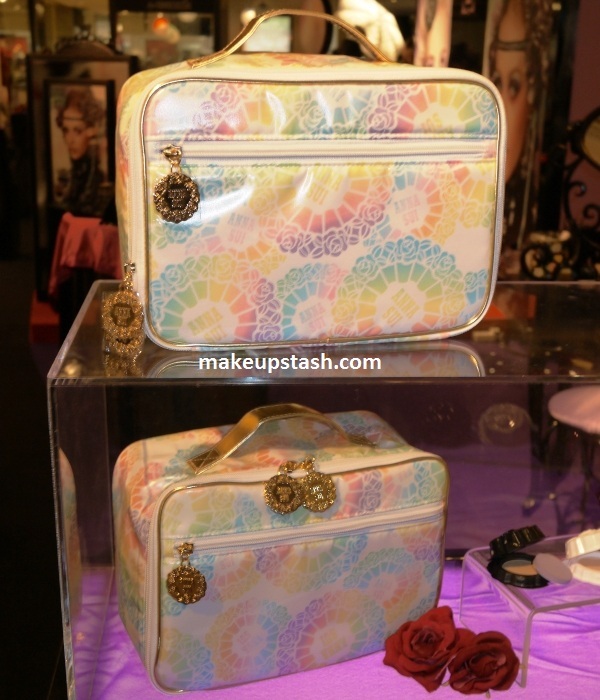 Here is a gift-with-purchase toiletry bag that has imprints of the shadow case design. Incredibly beautiful! Here’s the real sustenance that we needed to go the makeup distance. 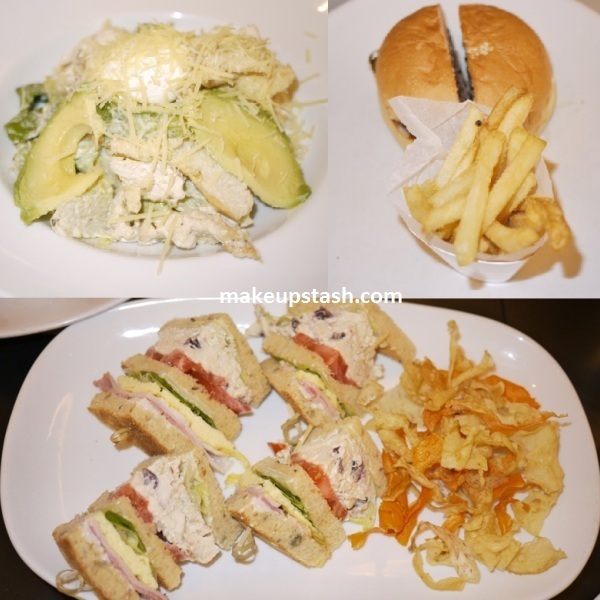 ;) Pictured are the Roast Chicken and Avocado Caesar Salad, the Marmalade Burger and the Pantry Club sandwich set. All very yummy! Here I am with Sara and Chantana. We were trying to contain our laughter – hence the wide smiles – because Iris and Kas were cracking us up as they were snapping our pic! As always, I had a fabulous time with these girls. 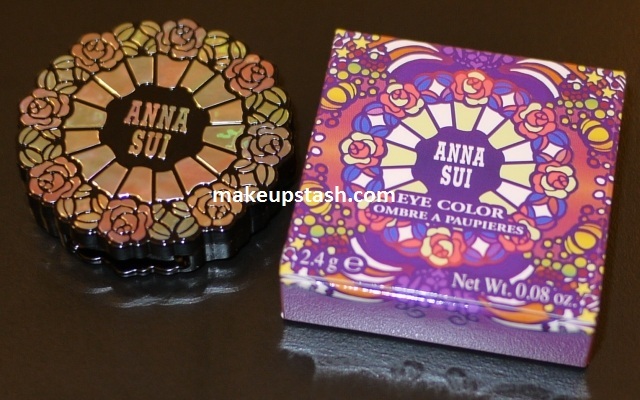 Everyone, smile and say ‘Anna Sui’! You always get invited to the most fun events. 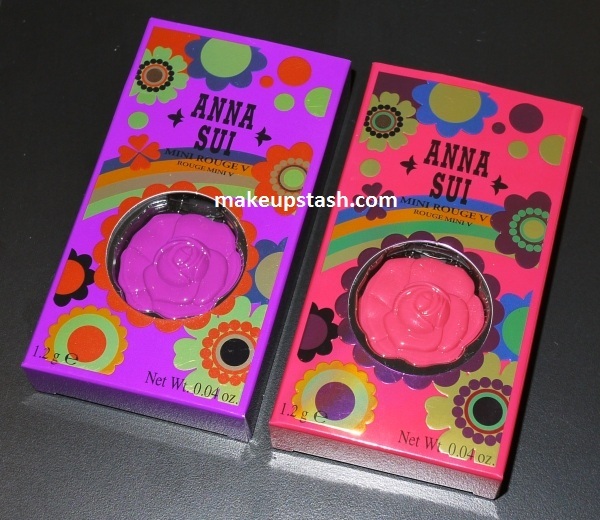 The Anna Sui people are very gracious and fun to be with; I always enjoy their parties! Never noticed the nail colours. 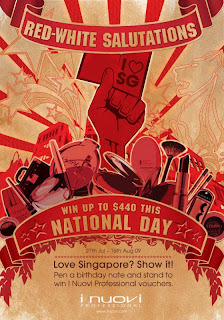 Think I must go check them in person later today. Love that black!!! 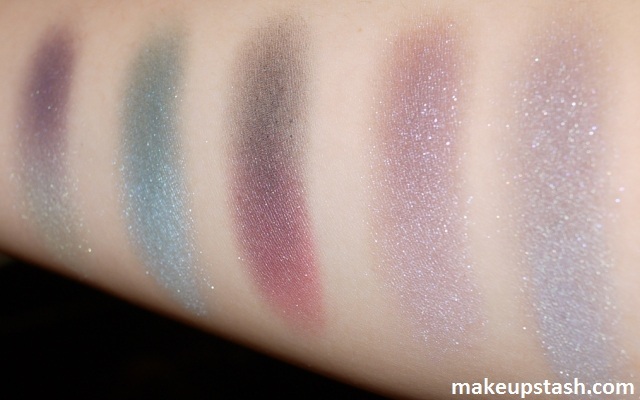 Wow, the eye shadow swatches look magical! The model’s channeling Natalie Portman in Attack of the Clones! OOh… it was a fun night!!! I love your entry… the pics all look so pretty and very details! What gorgeous cosmetics! 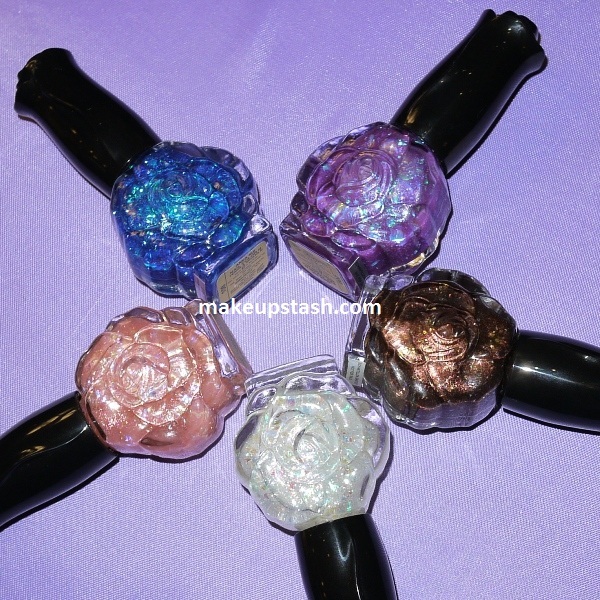 The polishes are just over the top stunning! Mag, No wonder I did not see it. I will check 003 next time I see an AS.